6 weeks to IMPACT lives, 6 weeks to LEAD & stand out, 6 weeks to EXPLORE Africa. Looking for what to do with the strike? Well, while many of us are crying, praying and fasting that the strike should be called off, not necessarily because we like school too much but probably because we are just tired of staying home and doing nothing, others are enjoying it and i bet by the time you’re done reading and analyzing this post, a fraction of people will be excited and inspired. 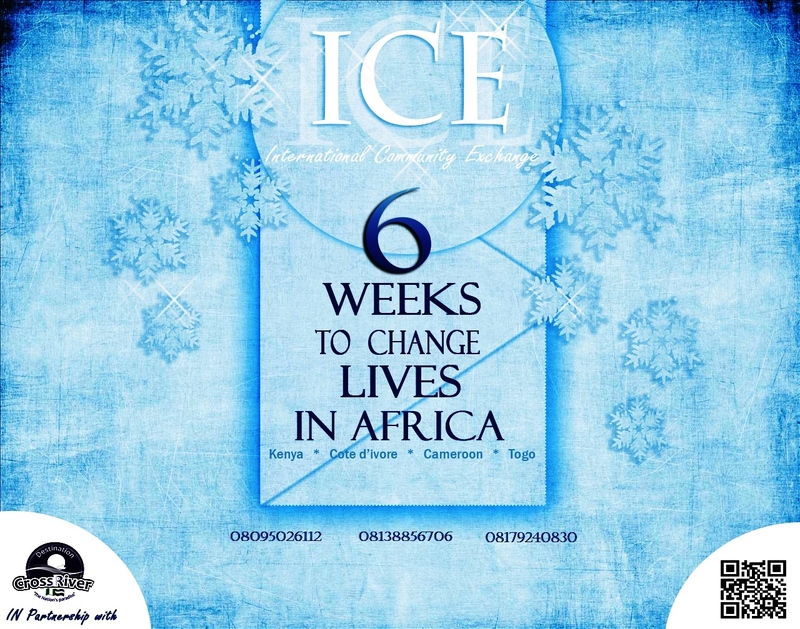 An initiative of AIESEC in Calabar, ICE (International Community Exchange) has been setup, to ensure that our youths (US, WE) are actively engaged during this unfortunate strike period, and there are offering a wonderful opportunity for everyone to develop and improve themselves in a list of selected countries, or any of your choice and fields. And so, while working to impact the lives of others through their various community development programs, you get to improve yourself, and gain a lot of skill to mention but a few; project management, team work, facilitation, leadership etc. This promises to be worth every second, every minute… REGISTER NOW!!! Before it’s too late. This entry was posted in Ads and tagged adverts, blog adverts, Horizon Inc, watch this space!!! !, welcome.. Bookmark the permalink.